This satchel tutorial is here just in time for Spring. With the changing of seasons, it's time to change accessories! Add a great new piece to your wardrobe in whichever fabric suits your fancy with this great tutorial. "I added an interior pocket since I was tired of having to fish around for my cell phone in the first version. I also added more interfacing to the lining and the flap, giving the bag a lot more stability. 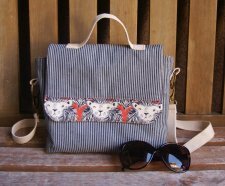 There were a few other minor changes, and they all make this satchel much better than the original." "At 9 x 10 x 3", this bag is just the right size -- big enough to hold all my stuff without making me feel like I have a suitcase strapped to my side. I also love having both a removable cross body strap and a small top handle to choose from when I'm on the go."